The Turks and Caicos islands are located south of the Bahamas in the North Atlantic Ocean. 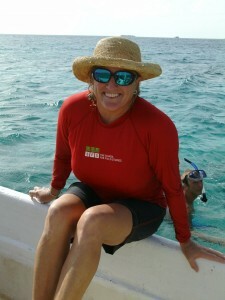 On these islands, Heidi Hertler is a Resident Director with the School for Field Studies (SFS). After spending nearly 20 years in the Caribbean, her passion for the ocean, science and students has flourished. In this entry, we get a sneak peak into studying abroad and living in paradise. What brought you to be a Center Director? I am a School for Field Studies (SFS) alumna. As an undergraduate, this program changed my life and has since greatly influenced all my career choices. I have made the Caribbean my home for nearly 20 years. In this time, I have lived by the SFS philosophy – teach environmental problem solving by working on real problems defined by the communities where you are located. Four years ago, I accepted the position of Center Director at the SFS Center for Marine Resource Studies in the Turks and Caicos Islands. As Center Director, I strive to provide students with a clear understanding of the value and management of environmental resources in a local context. I am extremely excited to live and work in the TCI and in an environment where I can have such an effect on the local community and future scientists. There are over 40 islands and cays that make up the Turks and Caicos Islands and each has many unique aspects – small fishing communities (South Caicos), large cruise ship terminal (Grant Turk), high end development (Providenciales). The SFS Center for Marine Resources is located on South Caicos. South Caicos is a beautiful island rich in natural resources (fishing capital of TCI) and local history (salt industry) with relatively little development (one small hotel). The climate is dry and almost desert like. At the Center’s door step are shallow and deep reefs, extensive seagrass meadows, mangrove forests, and white sand beaches. The local community is a confluence of many different cultures – TCI Islanders, Haitians, Dominicans, and West Indians – this diversity is a great opportunity to learn about Caribbean life. We all live and work together – research, site clean-up, kitchen crew, card games, outreach, sunset viewing. By the end of the semester, there is not much they don’t know about me or any of our staff. What are some of your favorite aspects of being a Center Director? Working side by side with students and community members to collect data that will directly impact local decisions and environmental policies. Every day there is a new challenge, where do I start…Managing logistics of a large center on a small, remote island would be the “challenge of the week”. South Caicos is a physically demanding environment. The amenities (fresh water, shopping, food variety , etc.) are limited relative to a student’s home environment. On top of that, our program is 6 days a week. Most adapt and leave with a great sense of connection to the island. Many of our students apply to return as Interns at our Center or another SFS program. Embrace the experience. Take every opportunity to explore the country and meet with the people. Disconnect from the internet – learn to play dominoes. Stop and watch the sunset. Take a swim in the ocean every day. Always remember we are all guests in the country. 1. Mask, fins and snorkel – you will use them more often than anything else. 2. Sunscreen and bug spray– second in use to mask, fins and snorkel. 3. A desire to be in the field learning. You are living in a community that is different then you are accustomed to – things are better and worse. 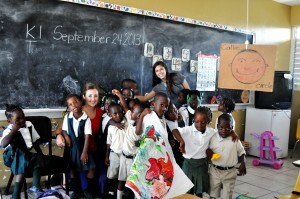 Study abroad challenges any preconceived ideas that you might have. To find out more about attending Heidi’s program, follow this link! Posted in Environmental Science, Resident Director, SFS, study abroad, sustainability. 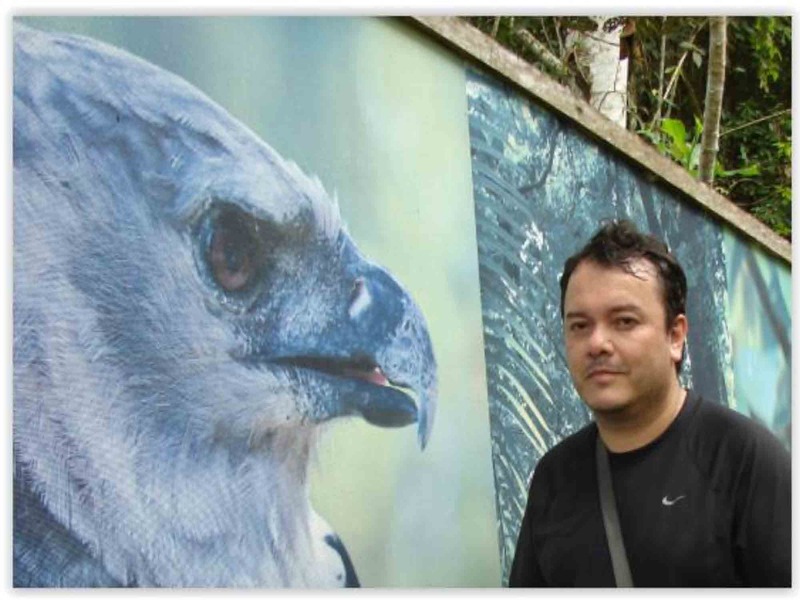 Gerardo Avalos lives in Costa Rica and works with The School for Field Studies (SFS) helping to spark student’s interests in ecology and sustainability. Atenas, Costa Rica, where Gerardo’s program is stationed, is small, yet beautiful. Gerardo invites OSU students out of their comfort zone, and into Costa Rica. I served as a Tropical Ecology Faculty for 6 years before moving into the Resident Director position. 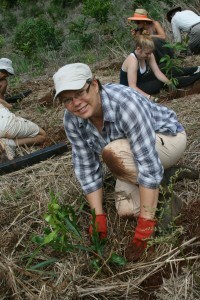 By training, I am a plant physiological ecologist with interests on multivariate statistics. Being a scientist is different from being an administrator, but I wanted to develop the SFS Center in Costa Rica in new directions. In addition to consolidating our academic program, I wanted the center to be a model farm and an effective research institution to generate information about the management and conservation of natural resources for our clients in Costa Rica (national parks, protected areas, and local communities) so that our students could get not only an authentic educational and research experience, but leave behind a positive footprint on the country. The center is located in the town of Atenas, just 40 min away from the airport and the capital city of San Jose, and about 1 hour away from the nearest national parks (Poás Volcano in the Central Mountain Slope and Carara along the Pacific coast). Atenas has only 20,000 inhabitants, but despite of being small, it has all the basic services. It maintains a very traditional Costa Rican community, with coffee farms covering 40% of the area. Here, students can see a representative part of Costa Rican rural communities, traditional coffee production, and the celebration of local holidays like Independence Day and the ox cart parade. Atenas also has a very diverse international community. This area of Costa Rica presents some of the most pressing problems of the country as a whole, such as water production and conservation, urban expansion, waste management, and conflicts between these issues and biodiversity conservation. Costa Rica has maintained a leading tradition of democracy and political stability in Latin-America as well as of biodiversity protection. It is also one of the most biodiverse countries in the Neotropics with about 5% of the estimated number of species concentrated here. In terms of running a program like ours, these conditions have many advantages. Field trips could span strikingly different ecosystems in one day. Students can compare and contrast different agricultural models and different community profiles superimposed on different ecological conditions. This is an ideal country to study environmental issues and analyze the balance between biodiversity conservation with economic growth. I spent one year at the School of Fine Arts at the University of Costa Rica studying history of art before switching to biology. I have an artistic side, and still do a bit of pastel and water color painting. I can also do cartoons, and have illustrated a children´s book. I did a bit of scientific drawing as an undergraduate student at the Biology Department at the University of Costa Rica. Observing the transformation of our students when they first come to the center and seeing how much they change and have learned from the program before they leave is very rewarding. Students could move on to graduate school, or to jobs that employ an environmental component, so you can see that the program has had a critical impact on them. This is mostly a balancing act. This goes across the board in terms of making sure the program works in all aspects. We plan our semester way ahead of time, looking at lecture schedules, community outreaches, field trips, and our week-long trip in Nicaragua. A program this complex is not an easy feat to accomplish. It requires experience and team work. Keeping a good team is critical for the program, the consistency of the educational quality we provide, and the professional development not only of our faculty, but of all our staff members. We are talking about a staff of 17 people, 9 of which function to support the program in terms of maintenance, cleaning, and cooking. It takes a long time and effort to form a good team. This is a residential and very structured program. Students need to adjust to community living. They compromise to change certain behaviors for the benefit of the internal community, and abide by the sustainability contract (which a previous group of students proposed a few years back). Implementing down-to-earth changes (improving recycling, water, and electricity use, for instance) could be hard, representing a compromise and a more conscious awareness on the consequences of our actions on the capacity of our planet to provide services. Being less resource-demanding does not mean a decrease in our quality of life. Being closer to nature has multiple benefits that improve your perspective on life. Unplugging from the internet and decreasing the use of your gadgets and social networks is also an important challenge for many students. Be open to new experiences; do not have preconceived expectations because every session is different and unique. What you positively learn from this will affect your life in the long-term. A good pair of binoculars and a digital camera. Humankind is very consistent across the board. We have an amazing capacity for ecological and cultural adaptation. However, we also have a puzzling aptitude to repeat the same mistakes. Learning that deep inside, across cultural borders, we are all the same, and have invented ingenious ways to adjust to challenging ecological conditions (hopefully without repeating the same mistakes) is the key to a more sustainable future. Respecting and appreciating the diversity of ways to relate to nature is something you cannot learn from textbooks. You need to step outside your comfort zone and see the world. To find out more about Gerardo’s program, follow this link! Posted in Costa Rica, Resident Director, SFS. 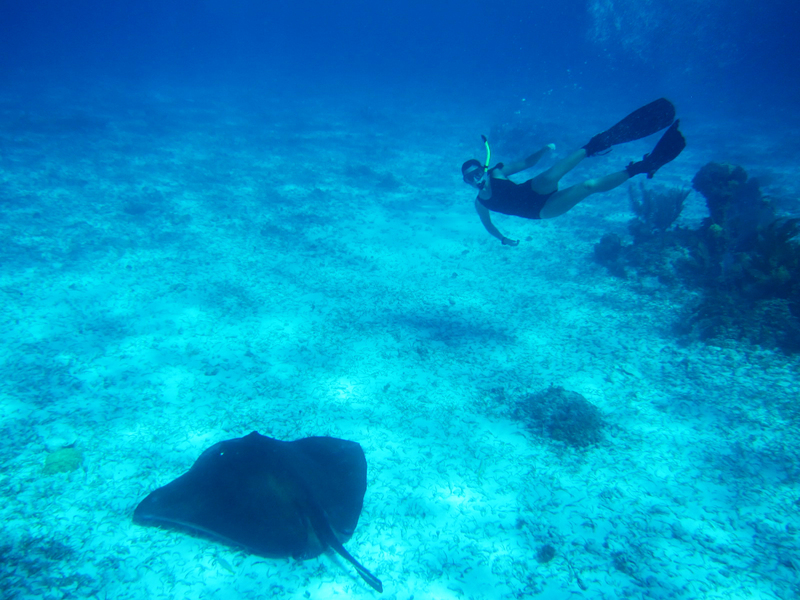 Jenna Wiegand, a senior in the University Honors College majoring in both Finance and Sustainability, spent fall term in the Turks and Caicos Islands studying marine ecology and environmental policy through The School for Field Studies. During her time studying in the South Caicos Islands, she wrote this entry about her new, and sometimes out of the ordinary life abroad. My ears are always salty from the constant snorkels and research dives. Every afternoon we have a field exercise or activity in the water, so there is hardly a day where I go more than six hours without being in saltwater (either the ocean or our saltwater showers). There is no fix to this. My bed is always sandy. There is no fix to this either, unless I put a rinse bin at the base of my bunk since our dorm floor is perpetually sandy. Oh well. Consider it nightly exfoliation? I have a serious bootie tan line. This is from my diving booties and this winter it will look like I am wearing permanent leggings. I am now a vegetarian. This was mostly because we eat enough rice and beans anyway and the meat options are not that appealing; plus the black bean veggie burgers are much tastier. All of us here at the field center count the days until the food boat comes in, and a pan of brownies calls for a stampede. I tried tofu. (Shock of shocks) It was good. Showering every 2 days or longer (once a week?) is perfectly acceptable here. Snorkeling and diving are seen as “pretty much showering” so there is no need for more. Yes, this is kind of nice but it is weird to think that what is completely normal here would never be fine in the U.S. I am a pro at back-rolling off boats to go diving. And I’m getting a little bit more arm muscle from hauling around my gear, weights, and tank (what… 40, 50 pounds?? It’s ridiculous). The best compliment you can receive here is “You look clean” or “Your hair looks clean”. Special occasions (or just evening cravings) call for a trip to town to buy a pint of ice cream. 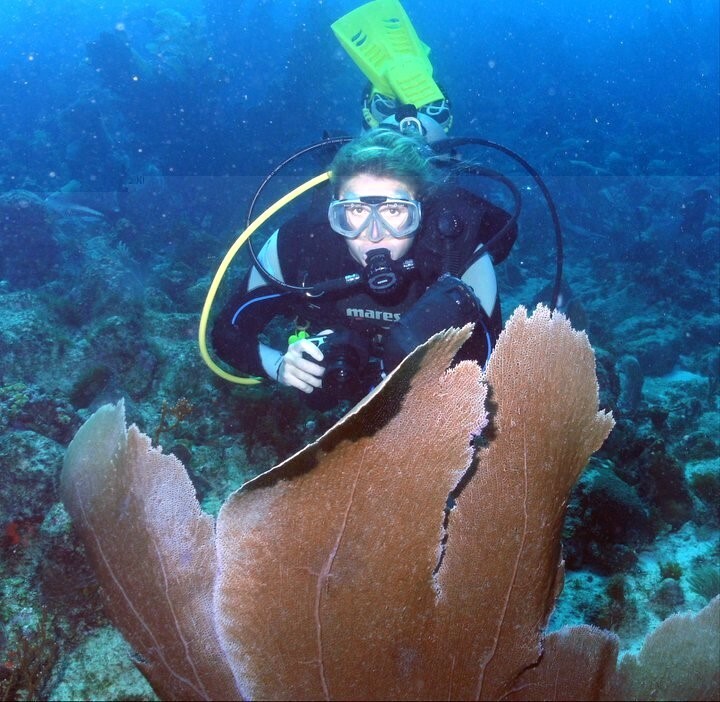 I can identify around 110 marine organisms… algae, corals, fish, sharks, rays. I have held a couple of sharks and have tried to catch a turtle (yes, “turtling” is a real thing). I have now spent 5.5 hours of my life underwater, and have dove to 73 ft! I will never underappreciate a washing machine again. I now do laundry the “easy” route which means forfeiting my fresh water shower and using it to fill up a tote bin so I can hand scrub my clothes. And let me tell you, to decrease shower use more, the shower has a chain pull that you must hold down the entire time to continue the flow of water. So there is no way you will lose track of time and take a 20 minute shower. Four pm snack might possibly be the best time of the day. I don’t even know what a sweatshirt is anymore. But clearly all is not bad in this place because I am loving it for the most part. Snorkeling and diving are indescribable, as are the sunsets. After dinner, the weather cools off and there is usually a breeze through the hammock area– then it is absolutely wonderful to be out. It is so nice to be a bit disconnected from technology and phones; a lot of the materialism and outward vanity of the U.S. is gone as well– you don’t have much, but it is so easy to be happy with what you have. So at the end of the day this place is pretty awesome, even with the cockroaches and the salt. Posted in College of Business, Returnee, SFS, study abroad, sustainability, University Honors College. Recent College of Agricultural Science graduate Kasey Moore not only received a B.S. 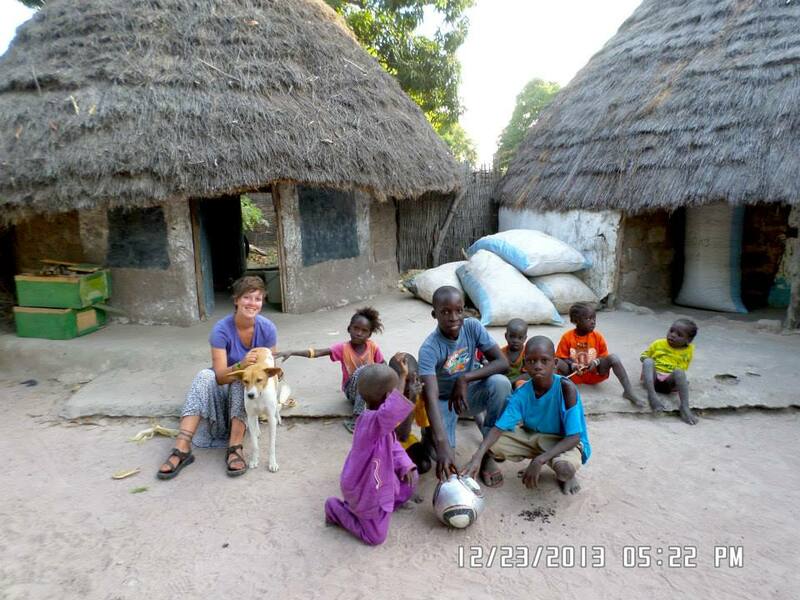 in Fisheries and Wildlife Sciences from OSU, but also had the opportunity to study abroad twice during her college career. As a sophomore, Kasey traveled to Valdivia, Chile to study at La Universidad Austral de Chile for a term, and during fall of her senior year Kasey hopped on a plane again, but this time to Africa to participate in the School for Field Studies’ Wildlife Management Studies program. Now, having explored the world as an undergraduate, Kasey is embarking on her grandest adventure yet—traveling the world with Cavalia. Most people find a job within their related field of study after they graduate from college. This is how I imagined my life after college would go, but things took an unexpected turn a couple of months prior to graduation. Instead of moving straight into a job within the field of fisheries and wildlife science, I will be running away and joining the traveling circu s.
The show is called “Cavalia” and was created by Normand Latourelle, who was also one of the original co-founders and managing director of Cirque du Soleil. Cavalia is very similar to many of the other Cirque du Soleil shows, except for the fact that there are horses as well as acrobats in the performances. The main idea behind the show is to give tribute to the relationship between horses and humans and to document their place in history through an artistic and visually stunning performance. I first heard about this job opportunity through an old friend of mine who I grew up riding with in the United States Pony Club. She is currently on tour with Cavalia and working as one of the team’s veterinary technicians, and in April she sent a post out on the Oregon Region’s Pony Club Facebook page advertising the position opening. This seemed like the perfect fit for me, as it incorporated the two things I am most passionate about: traveling and horses. 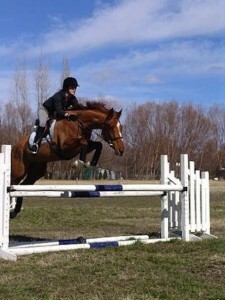 I have spent most of my life around horses and involved in the world of 3-day eventing and dressage. My 13 years of involvement with Pony Club has allowed me to achieve all 10 certifications within the organization, and given me countless valuable skills for working in the horse industry. I have also been lucky enough to participate in two study abroad programs during my four years at Oregon State. The first was in Chile during my sophomore year, and the second was a program through the School for Field Studies in Kenya and Tanzania during my senior year. Both my horse and travel experiences helped me to obtain this position within Cavalia, and now everything is becoming very real. I will be leaving for Brussels, Belgium two days after OSU’s spring commencement ceremony and begin my journey working for this incredible show! 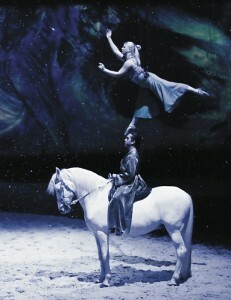 I will be working as a groom, meaning I will be taking care of the 47 horses that Cavalia has as they tour the world. Daily routines will include basic barn chores, exercising and warming up some of the horses before each show, and getting the horses ready for each of their evening performances. After the show ends in Belgium, our next stop will be Singapore, and then other major cities throughout Asia for the remainder of the year. Needless to say, I am extremely excited for this opportunity and to work with these talented horses and tour the world at the same time! Posted in Chile, College of Agricultural Sciences, Returnee, SFS, Tanzania. SFS – The School for Field Studies – is one of the official partners with OSU in study abroad. All of the SFS programs are approved at OSU and available to all eligible students. 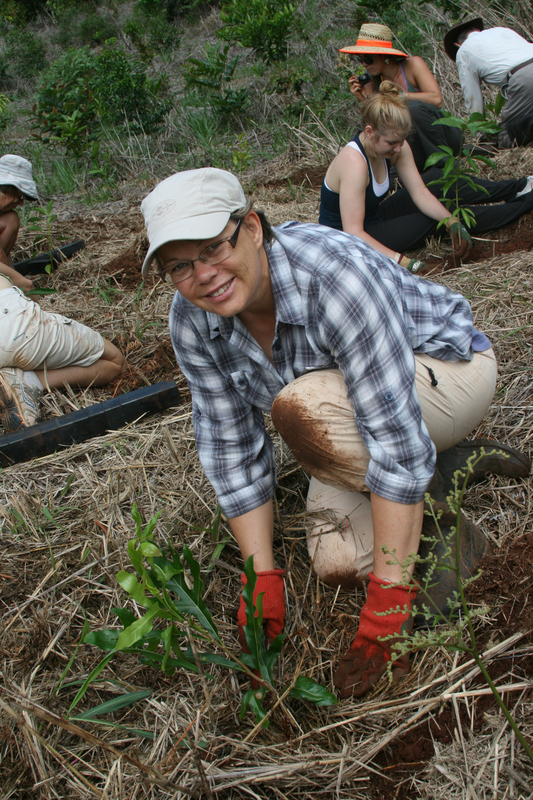 You will be part of an international research team working to solve it, whether you are replanting critically fragmented rainforests in Australia or helping Costa Rican farmers transition to organic agriculture. You will develop leadership skills, build self-confidence, and discover the vital role you can play in the larger global community. You will develop personal relationships with members of the local community, putting a human face on the environmental problems you are studying, which is often the most rewarding part of the SFS experience. You will be challenged and inspired by the work you do. Your work will make a real difference in a local community and make a positive contribution toward the sustainable use of the world’s natural resources. SFSprograms are high-quality interdisciplinary academic, undergraduate-level programs. SFS “classrooms” include coral reefs, rainforests, and African savannas; the focus of our research ranges from wildlife conservation to rainforest restoration. SFS programs are designed to teach students about critical local environmental problems and train them to do field research that will help address these problems. Our faculty provide core lectures needed to understand the content areas pertinent to case study and research questions. Field exercises complement classroom lectures and help students to develop skills needed for Directed Research projects. The School for Field Studies (SFS) awards over $300,000 in need-based scholarships and loans each year with roughly one third of SFS students receiving some type of aid. Posted in Australia, Environmental Science, Scholarships, SFS, study abroad.